Throughout our life’s journey there will be times when our Soul pushes us to grow. These are the times we seem to resist the most. These periods in our life become our fight against change and our refusal to alter what we think. Because of our denial to bring attention to what is hurting us inside, we reject our Soul’s nudging to evolve, when we do this we set ourselves up for periods of feeling down and depressed. Our goal in this life time is to clear our ancestral conditioning, so we may become more authentic, genuine and real. In order to find this place of honesty within us, we must endure the pain that arises as we do our inner work. There are wounds beneath the surface of our Self, these wounds are unhealed injuries caused by the conditioning of our mind. Our work is to uncover, reveal and tend to these weakened parts of ourself, so we may mend, but also so we may recover the spirit of who we are and become more sound and spiritually healthy. So many of us humans have become brilliant actors and great performers, hiding away the pains deep within our psyche that are too deep to face. We lock away our feelings and become professional pretenders, simulating our emotions that all is happy and well. For some even the art of imitating eventually fools none, especially ourself. Why do we resist so terribly what we know we cannot deny? Everyone wants to be happy, we all say we do, but happiness comes with a job to do, this we know, but we run like hell as far away from our feelings as we can. How can we be human if we don’t allow ourselves to ‘feel’? What we so terribly misunderstand is the craft of our inner healing, this is a tragedy indeed, because what we fight and refuse to battle, is simply only the struggle to accept ourselves and find peace in who we are. Soul work is not easy, I won’t lie to you, but the rewards are endless and the price for Freedom is worth the temporary uncomfortableness. 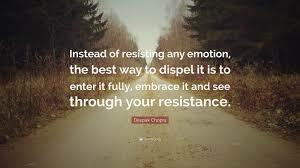 Let go of your resistance to grow, and know it is ok to be fearful, for now.